By Małgorzata Koperska - MD and Filip Derma. What does a child's height depend on? This child height calculator answers the question of how tall will your children be? We use two very different methods and describe in detail how to calculate a child's height. 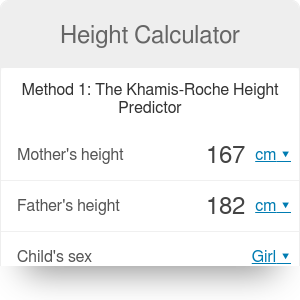 If you already have a child over four years old, our future height calculator uses a scientifically proven formula to determine their height. But if your kid is younger, you're just curious, or maybe you are pregnant, we have a child height predictor that calculates the child's height basing on parents height. It's called the Mid-Parental Height Formula. In the article below you can learn about a variety of height related topics, such as when do girls and boys stop growing and what is the average male height. Moreover, we are discussing how to get taller (and whether it is possible at all). How tall will my child be? Will they be as tall as the dad or average like their grandpa? These questions thrill almost every parent during pregnancy and while the child is continuously growing in the early years. Lots of us believe that children are usually taller than their parents. For sure, that is not a rule, and these trends vary from child to child and from family to family. Nutrition - growth requires a lot of energy! Overweight children tend to be taller than others, but staying fit is crucial for their development. You can check your ideal weight using our ideal weight calculator. Hormone levels, especially growth hormone or thyroid hormones. Health conditions, such as coeliac disease or arthritis. Medications, such as corticosteroids, can affect growth. Genetic conditions: for example, children with Marfan's syndrome tend to grow higher, while children with Down's syndrome are usually shorter than others. As you can see, one of the most crucial aspects is nutrition. It is so significant that scientists suggest the proper question to consider should be "How much variation (the difference between individuals) in height is attributable to genetic effects and how much to nutritional effects?". The answer is that about 60-80% of the individual's height is determined by genetics. The role of environmental factors (especially nutrition) is estimated to be around 20-40%. These numbers come from estimations of the heritability of human height and from research examining what proportions of the height variation are determined by genetics. Basing on various scientific studies, heritability contributes to around 80 percent of a child's height. A Finnish study on almost 9000 twins arrived at results of 78 percent for men and 75 percent for women. As we can see, the heritability varies even for men and women. These values may vary a lot between ethnic populations as well. This is mainly due to different living environments (including nutrition, lifestyle and climate conditions) and different genetics combinations across communities. In Asian and African populations, the height heritability is notably lower. Miao-Xin Li of Human Normal University in China estimated that in the Chinese population, the heritability equals 65 percent. A similar value was found in studies done by D. F. Roberts in western Africa. Heritability allows us to consider how the person's height is determined. Let's analyze it on the following example: a man who is 183 cm (6 ft) tall. The white male population has an average height of 178 cm (5 ft 10 in) with a heritability of 80 percent. Our individual is 5 cm taller than the population average. Analysis of heritability suggests how much of his extra height is a genetic cause and how much is due to environmental factors. In this example, we can say, that 4 cm of his extra height is thanks to genetics (80%) and the 1 cm (20%) is an environmental effect (probably a result of good nutrition). There are a few methods of predicting the growth of a child. Some of them use mathematical estimations as a base and are totally safe (because the child is not exposed to any hazardous factors). The one we provide here (the Khamis-Roche Formula) is proven to be the most accurate without the use of skeletal age. The most straightforward method (Mid-Parental height formula) is based on parents height. The other conventional method of height prediction uses the roentgen radiation (which is potentially hazardous). It is, however, the most accurate way. Determining the child's "bone age" is done by using X-ray medical imaging of the child's hand. The adult height of a child can be predicted using a simple mathematical equation using parent height, current child height, and current child weight. It is valid for children above the age of four. This method of height prediction is known as the Khamis-Roche Method, and it was developed in 1994 at Wright State University in Dayton, Ohio. The publication by Dr. Harry Khamis and Dr. Alex Roche was called Predicting adult stature without using skeletal age: the Khamis-Roche method. It's the most accurate method of child height prediction without determining the skeletal age. You can access it here. For boys, the margin of error is 2.1 inches, and for girls, the margin is 1.7 inches. Please note that this future child height calculator was developed by research on a group of Caucasian children so it may be less accurate for kids of other ethnicities. You can expect a margin of error of about four inches either way. You can convert metric to imperial length units using our length calculator. As we have already discussed, a child's height is primarily determined by genetics. However, it does not depend solely on the parents height. It's inherited in a way so that children may be taller or shorter than their parents since height inheritance is polygenic - the answer to how tall your child will be is scattered among many genes. The maturity of a child's skeletal system might be estimated by using a bone age study. It consists of taking a single X-ray of the left wrist, hand, and fingers. It is a painless procedure that exposes the individual to a very small amount of radiation. Afterwards, the image is compared to standard images from a bone development atlas, where the references were made on large studies of kids. Bone age is measured in years. The growth of bones is possible thanks to a particular area within two ends of long bones - the growth plate. This is a hyaline cartilage plate, which consists of actively growing cells. These plates can be found in children's bones, and, in adolescents, they turn into an epiphysial line (the residue of growth plate). This replacement is called epiphysial closure or growth plate fusion. The fusions complete in age 12-16 for girls and 14-19 for boys. Growth plates are easy to identify on an X-ray because they are softer and contain less minerals than standard bone. That makes them appear darker than the rest of the skeleton on the X-ray image. They look different at each age - thanks to that, a doctor can determine the bone maturity by simply reviewing its appearance. Then, the image is compared with the closest matching image from an atlas. Observing a difference between a child's bone age and their chronological age may point to a growth problem, but it is not the rule. Some kids with perfect health can have a disparity in skeletal and chronological age. orthopedic as well as orthodontic problems, the treatment of which must be planned according to child's predicted growth. Standardized growth charts are an essential tool used by doctors to determine whether a child is growing as expected. They are based on regular measurements of a child's height, weight, head size, and BMI. To find these values, you can use our BMI calculator. The most popular charts are the WHO Charts for infants and children ages 0 to 2 and CDC Charts for children above 2. You can check them here. They are also helpful for judging the onset of puberty in an older child. Growth process differs between girls and boys. Female growth is fast in childhood, and when they reach puberty, it speeds up rapidly. They achieve adult height usually at the age of 14-15, or a couple of years after menstruation occurs the first time. Following the growth charts from CDC, the average height of adult woman at age 20 is 64-65 in (163 cm). In the table below, you can find a few other numbers for different ages. Boys come into puberty later than girls. They start entering it at the age of 12-15, so the biggest growth happens around 2 years later than for girls. The rate of height growth for most boys slows down around 16 years old, but their body mass (mainly muscles) continue to develop. According to CBC, the average male height around 20 years old is 69.5 in (177 cm). Check below for the median height of boys during childhood and teenage years. Many people are not satisfied with their height. That is the reason why they keep asking questions like how to get taller? Is it possible to increase height? How can I grow taller as an adult? Firstly, we should consider a general question - is it possible to increase the height after puberty at all? In the text above, we found that majority of a persons height is determined by genetics (60-80%), and the body grows by lengthening its long bones (thanks to special cartilage located in long bones - growth plates). The conclusion is that after the closure of growth plates, it is not possible to increase bones length. It means that a human cannot grow taller. However, we can observe slight daily variations in height for most adults. The cause of these changes lies in spinal disc compression through the day. Daily activities impact the disc cartilage, which results in their height reduction. Note that we are tallest just after night and shortest at the end of a long and active day. You may come across myths about some techniques that will allow you to grow. Most popular activities are certain forms of exercising (e.g. weightlifting) and stretching. Unfortunately, there is no good scientific evidence to prove these methods. We would recommend that you do not let it worry you, as it is something that you can do seemingly nothing about. For sure, during the childhood and teenage years, while puberty time is on, a healthy lifestyle allows your kid to grow in the right way. At that time, it is very important to sleep enough, eat well (provide enough macronutrients and micronutrients to the developing body), and do sports. Remember that Omni Calculator is not a doctor. If you believe your child is too short or too tall, please consult a pediatrician. Małgorzata Koperska - MD and Filip Derma. Child Height Calculator can be embedded on your website to enrich the content you wrote and make it easier for your visitors to understand your message.